Spending a week in Mumbai during the Synergies workshop and a day in Pune – the other city where Teach For India places its fellows – helped me clarify one of the big questions I’ve been asking myself for a long time. I still don’t know, but being part of the Teach For All community, I’m sure we’re getting closer to having an answer to this question. A couple of experiences in Mumbai and Pune helped me clarify my own thinking on this. Aditya Natraj, founder of the Gandhi fellowship, facilitated a discussion on personal transformation. The key theme that connected various aspects of the talk was ‘human excellence’. One of the definitions really stuck with me- human excellence means becoming the best that I can be. When I was started to think about this in the context of teaching, the obvious question was – what does this mean for a teacher? Does it not mean that we should help all of our students become the best that they can be? If we wanted to do just that, what exactly should we do? It seems a big part of the answer has to do with ensuring that every child learns to the very best of their ability. In almost all the classes that I have visited recently there are some students – and sometimes a lot of them – who have fallen behind their peers in terms of academic achievement. Unless there is a teacher who inspires them to be the best that they can be, many of them will have very few opportunities in their future, both educational and job opportunities. Unless there is a teacher who believes in them, many will continue to have low aspirations and therefore will never become the best that they could be. 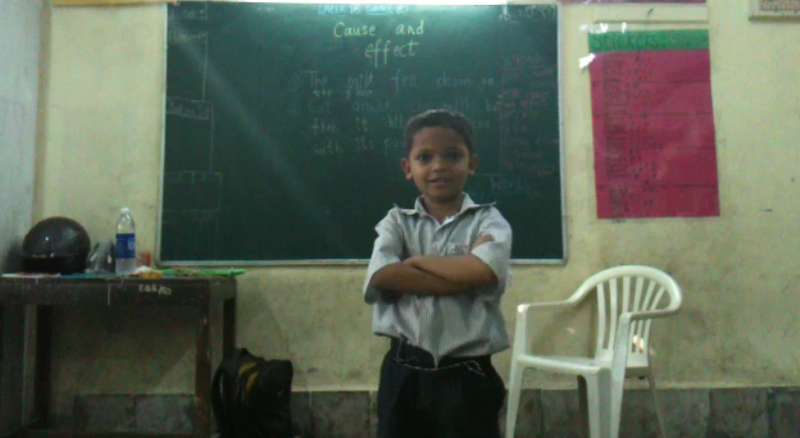 And one of my favourite ideas I came across in a Mumbai classroom: Grace under pressure. Above is a picture of a student who spoke no English a few months ago, and now had to speak for one minute – in English – on a topic of his own choice. Last time he had the same task a few weeks ago, he did not have the courage to say a single sentence, and tears came to his eyes. This time I witnessed him speaking for about 30 seconds and then bravely standing there until the minute was over. When the minute was over, his teachergave him a huge celebration to congratulate him on the progress he had made over the past few weeks! And you could see how happy he was about it! I was in this classroom thinking that if students become comfortable in situations where they feel a lot of pressure, this will be hugely valuable to them in their future lives. That will help them face difficulties, either at school, at work or at home, and have the courage to overcome them. The incredible thing was that students in this class had made, on average, 2 years of academic progress in the past 7 months! So clearly, it was a class that was focused on values and achievement. And clearly there was a teacher that inspired his students to be the best that they can be. I’d love to hear reactions from everyone – what do you think is the role of human excellence in teaching? What are the challenges and joys of helping students become the best that they can be?